Classically Liberal: He won't be there, but I will. I have had two short discussions of the Brendan Burke story, here and here. You will remember that Brendan is the son of Brian Burke and that the family is well-known in the field of hockey. Brendan was himself a hockey player in high school and worked with his university hockey team as student manager. Brendan told his father that he was gay and ESPN carried a story about how his family and his team mates responded. Brendan was recently checking out law school when the blizzards hit the Midwest and he was killed in a highway accident as he was trying to return to his university campus for a hockey match. He was buried only two weeks ago. 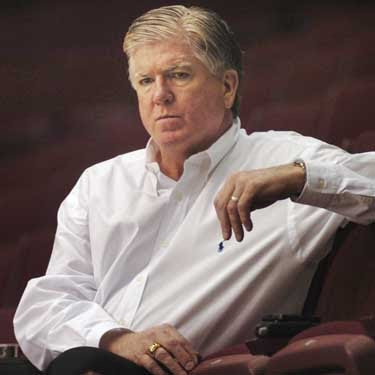 Brian Burke buried his son but had no time to himself. One week after Brendan's tragic death Brian was in Vancouver. He is the general manager of Team America, the US Olympic hockey team. An upset victory over Canada means that Burke's Team America is in the semi-finals where they are favored to win over Finland. This walking stereotype of masculinity, this bear of a man, loved his son. When Branden's body was being flown home, Brian sat with him, his hand resting on son's chest, the whole way. Brian told Sport's Illustrated that he had told Branden that when Toronto's gay Pride Parade would be held this year, that he would be there. Brian said: "I'd promised him I would march with him. He won't be there, but I will." posted by blog owner at 2/26/2010 08:58:00 AM DiggIt! Reddit Del.icio.us Slashdot It!